Does breastfeeding increase the risk of food allergies? Last Thursday (13 January 2011) the British Medical Journal published a report byMary Fewtrell and colleagues into whether exclusive breastfeeding for 6 months, which is the current WHO and UK Department of Health recommendation, could actually be bad for babies and, of particular interest to us here at Food Allergy Kitchen, that such a practice could actually increase the risk of developing food allergies. The full report is available on the British Medical Journal (BMJ) website but I have reproduced the section that relates specifically to allergies below. In brief, the researchers were not disputing the proven benefits of breastfeeding for both mother and child, rather they were questioning whether 6 months was too late a time to start weaning. The conclusions of this research were that leaving weaning until 6 months may actually increase incidence of food allergies, particularly those associated with wheat and gluten. The research also pointed out that allergies are rising despite advice to avoid certain allergenic foods, and in countries where peanuts (for example) are generally eaten at younger ages, the incidence of allergy is actually lower. Note that the research actually concluded that weaning before 4 months is also associated with later digestive problems, so in summary they are recommending a return to the practice of weaning between 4 and 6 months, which as anyone who had a baby before 2003 will know, was the advice mother used to be given. From my own perspective, my small allergy-ridden boy was breastfed for 7 months, but started weaning at about 5- 5 and a half months, so as a test case he is decidedly inconclusive. As with everything else, as a mother you need to take everything and all the advice into account and make your own mind up. Easier said than done, I know. We would love to hear your comments on the BMJ report and whether you agree or disagree with the results. Kramer and Kakuma’s original review did not find a link between exclusive breast feeding duration and allergic disease (box 1). Important new data are now emerging with implications for practice. Paradoxically, many developed countries have rising rates of food allergy, despite increasing advice to restrict and delay exposure to potentially allergenic foods, including cows’ milk, egg, fish, gluten, peanut, and seeds. Moreover, countries where peanuts are commonly used as weaning foods have low incidences of peanut allergy (Israel, for example 23). These observations have prompted further work on immune tolerance to foods. The development of immune tolerance to an antigen may require repeated exposure, perhaps during a critical early window, and perhaps modulated by other dietary factors including breast feeding. A 2008 review24 found an increased risk of allergy if solids were introduced before three to four months. After four months, the evidence was weak, but suggested an increased risk with delayed introduction of certain allergens. For example, the incidence of early onset coeliac disease increased in Sweden following advice to delay introduction of gluten until age six months, and it fell to previous levels after the recommendation reverted to four months. Subsequent analyses suggest that gluten should ideally be introduced in small quantities alongside continued breast feeding.25 A more recent study in infants at risk (with a first degree relative with type 1 diabetes or carriage of certain HLA types), showed that introduction of gluten before three months and after six months was associated with increased risk of biopsy proved coeliac disease26 and islet cell autoantibodies27. This finding suggests that gluten may best be introduced during a critical window of three to six months. In the same cohort, introduction of wheat after six months predicted increased risk of wheat allergy at age four years.28 Two UK randomised trials are now investigating early introduction of allergenic foods: the Learning Early About Peanut Allergy (LEAP) study (http://clinicaltrials.gov/ct2/show/NCT00329784) and the Enquiring About Tolerance (EAT) trial (http://www.controlled-trials.com/ISRCTN14254740). Previous Food allergies on the rise… Next Cow’s milk allergies- less common than you think? Do you know what? I’m not posting a blog on this, because it could fan the flames of something that’s always there smouldering, and the latest research has done nothing to make it flare or flounder. And, I couldn’t write about it as eloquently as you can. What I do know is that a happy mum = a happy baby. And if that means weaning differently to however the latest guidelines tell you to, so be it. Apparently, there’s a big no no to do with doing it before 17 weeks of age, so I’d try to stick to that, but other than that, it’s got to down to your individual preferences and circumstances. My first hand experience is that babies can sleep through the night without needing formula feeds to keep them full and that weaning does not make them sleep more. 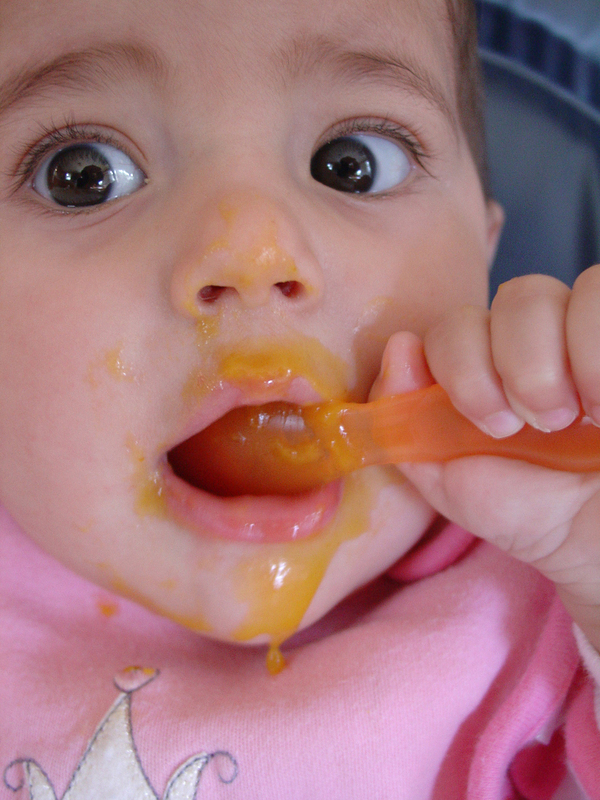 I’ve also experienced two boys who have eaten very differently in the weaning process. The one who was more tricky is now more of a feast or famine eater and the good one is the one who is more work from a bribery perspective. This is despite my doing the same things with both of them. The point I’m trying to make is that babies are all different, and so we cannot assume that the outcomes of one research paper will or will not apply to our little person..
Here’s hoping we can have some more support for women developing their ‘mummy instinct’ and learning to pick and choose to read or ignore things with confidence, if they feel it’s not relevant to them. As a test case tho – my peanut/treenut/legume allergic child is my middle one and my only breastfed one. My first SMA baby is completely allergy free as is my third who was on SMA after 8 days waiting for my milk to come in (I do wonder if the stress of endowing him with the same allergies as his brother contributed to the stress of all that….). But perhaps allergies just occur and we should stop beating ourselves up about it?! Very interesting point about the bf child the one with allergies, when ‘standard’ argument would be the other way round. You’re right – it’s SO easy to beat yourself up – I should know – I’ve been doing it for 13 years now!